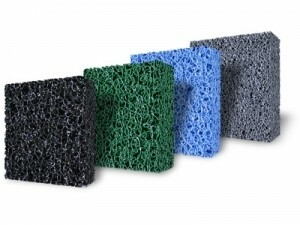 The various densities can be used in sequence or separately for unique filtration requirements. This is one of the greatest characteristics which Matala has to offer. No other media on the market can perform this step-wise filtration. Matala effectively separates large particles to small and still maintains a very aerobic and free flow of water without channeling. Matala is slightly buoyant and will not sink to the bottom of your filter. Matala stood vertically on end will not float. Matala stacked horizontally will hold each other down.